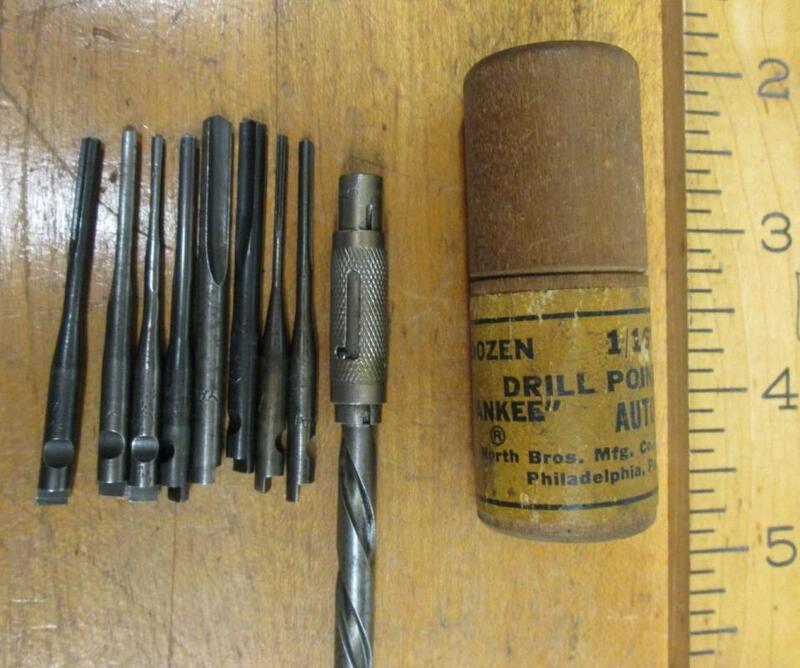 This is a nice clean, rare, antique spiral push drill marked "YANKEE NO. 43 NORTH BROS. MFG. CO. PHILADELPHIA P.A. U.S.A.", on the main shaft of the drill. 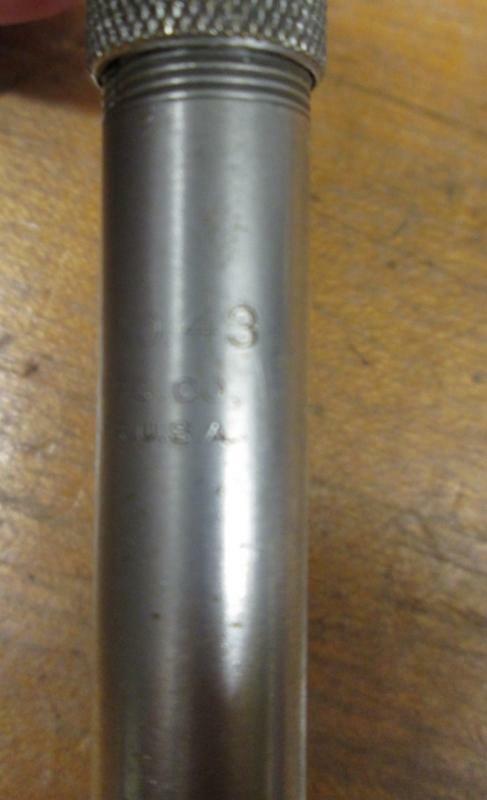 It comes with a round wooden case of drill points that is marked "NORTH BROS. U.S.A." also,. The drill point set is complete with 8 different sized fluted drills (a full set) in very good to new condition, inside the case, (from 1/16&quot;-11/64&quot;). The wooden case is for drill point, but originally had all one size in it, so it is a bit larger than the Yankee set of 8 bits since this one is designed to hold 12 bits instead. In this style push drill there there is a knurled ring that slides, and locks in place to hold the drill point in the chuck (much smaller in diameter and lighter weight than the other screw or spring chucks North Bros. patented. This type of drill chuck works just fine, and so does the light weight push drill for that matther. There is no drill point storage like many of the others from this period (1902-1946), so we provided a case to store them in for you. This particular model is quite rare, particularly in this nice of condition, with about 90% of the nickel plating intact, a few very minor scratches, a nice solid rosewood end knob, no cracks, well attached, and a good strong return spring. We don't see really any wear on the machanical parts at all. 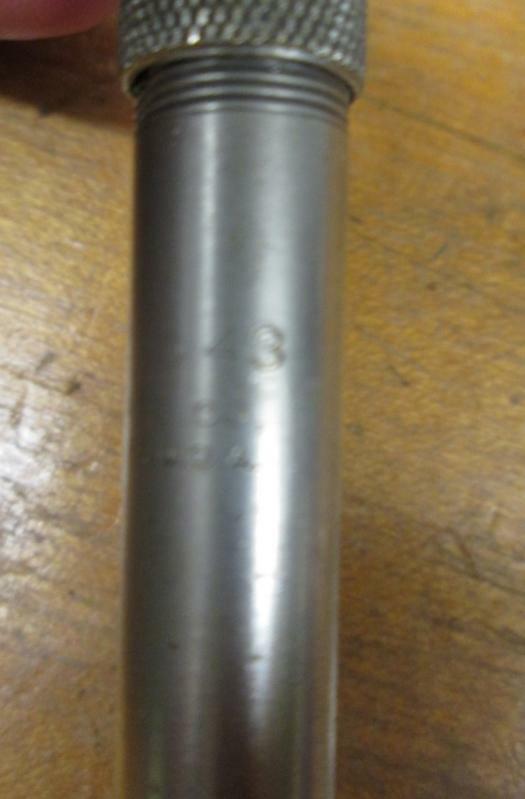 It measures 9.4&quot; long overall. This push drill uses the Stanley or North Brothers "YANKEE" type drill bits with the notch and flat on the shank. The points included are most likely from the 1950's era, but in very good condition, and quite hard to find these days. Works great!. A very rarely seen collectible tool! Items Similar To "North Brothers Yankee No. 43 Push Drill w/8 Bits"